My History with Mizuno: I like Mizuno and like most people, it took me a while to find a brand that truly felt like it belonged on my foot. I have a longer, narrower foot and Mizuno fits me well. Over the last year, at the advice of my physiotherapist and coach, I have been bringing my shoe height down to a more natural drop. The last shoes I ran in before the move to the Cursoris were the Ronins. Prior to that I ran in Wave Riders and Precisions. It’s been a slow progression, so at the introduction of the Cursoris, I was very interested and ordered a pair as soon as they became available. Designed to provide a more stable platform and cushioning for someone transforming to a midfoot strike. ZERO RAMP offset between the heel and forefoot provides a natural plane tailored to a midfoot strike. WAVE TECHNOLOGY in the forefoot for maximum protection, comfort and a smooth ride. Flat-bottomed forefoot design coupled with a wider platform provides stability and assurance from foot strike to toe-off. 12mm/12mm heel-forefoot design offers a more protective ride. – On my foot, it was very light and barely noticeable. – No drop compared to the 10mm drop. – very addictive shoe, comfortable and light. 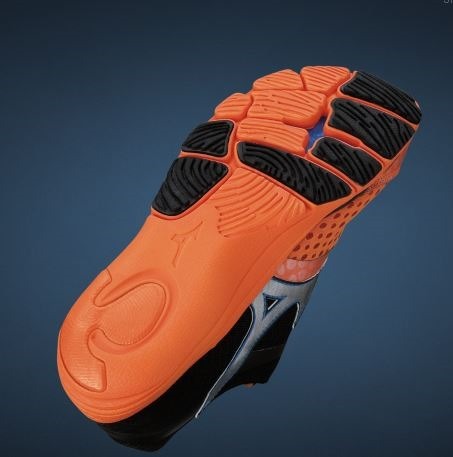 – Mizuno seemed to find a way to reduce weight by stripping the rubber sole away. If you notice the above picture, you will see that only some of the sole is rubber, the rest is foam. This is the one downfall I can see with this shoe. The foam does not last long, and you will be going through shoes quickly if you are a medium to high mileage runner. Also, you will notice on the heel, there is a planted piece of foam. For some reason, these pieces started tearing off. After 3 months, these shoes were dead because of the foam, but otherwise structurally intact. – One other concern I have is winter-ability. Having picked this shoe up in February and still transitioning to a zero drop, I did not get a lot of Winter Running in. I am not sure how the lighter fabric and foam will hold up to the wet, sandy and salty conditions of a winter run. There is not much fabric to separate elements ( as mentioned the fabric is light ) and it’s possible a shoe that already wears out fast could wear much faster. You can probably expect wetter then normal feet. I really, really like the feel and comfort of this shoe. The foam sole situation is a little dicey for me and I am not happy that I will be going through shoes much quicker, but I am willing to live with this (for now) given the other benefits. Obviously, the less is better concept does have some counter balances. It fit well, it was very light and very comfortable to run in. I will be looking for a shoe this fall to carry me through the winter, but this shoe will do a good job for the other 3 seasons. 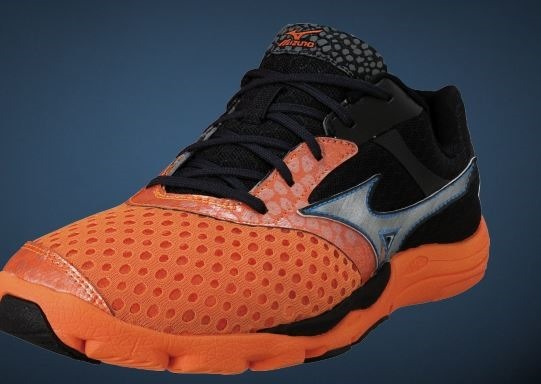 If Mizuno puts a little more effort into their sole, this shoe will move from being good to great. If they can do this without adding weight, it will be excellent! I have the same comments you have about this shoe. I wore them on a cold day when I first got them and my feet froze..not a Canadian winter shoe. As well, I can’t wear them barefoot for triathlon as they have awkward rub spots.